A shrewd piece of placing by Linda saw Knock Boy contest a Class 3 novices chase at Kempton (21/11/2001). With just four entries he was guaranteed prize money if he completed. Starting at 100/1 he could never go with the odds on leader but with a good round of jumping under Charlie Studd and the departure of the second favourite, he was able to collect just under a thousand pounds for finishing 3rd. She's Humble returned to the racetrack after her summer break at Fontwell today. Patiently ridden by Andrew Thornton she was able to steal 4th place on the line and earn a little prize money for her owners. 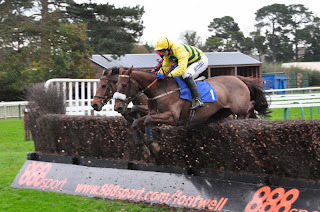 Knock Boy earned a little prize money when he finished 4th in a handicap chase at Towcester today. Riden by Jamie Moore he was settled in midfield and was moved up to the heels of the leader on the hill before the final straight. He was not able to quicken and was caught for third place on the run in after the last.